If you happen to be around Empire Shopping Gallery at Subang Jaya lately, I am sure you will notice a new glass building which looks like a greenhouse outside. This new little building is home to cafe and restaurant, Jibby and Co which has been opened for more than a month now. Yes, residents of Subang Jaya will be pleased to hear that they no longer have to travel to Bangsar or Mont Kiara to get a lovely atmosphere and food. The concept of Jibby and Co reminds me of a lot of cafes that I have been to while living in Perth, Western Australia. With lightbulbs hanging down from the top, glass windows for light to penetrate through during the day and communal tables, the interior is not only classy, but it is also comfortable and homely. 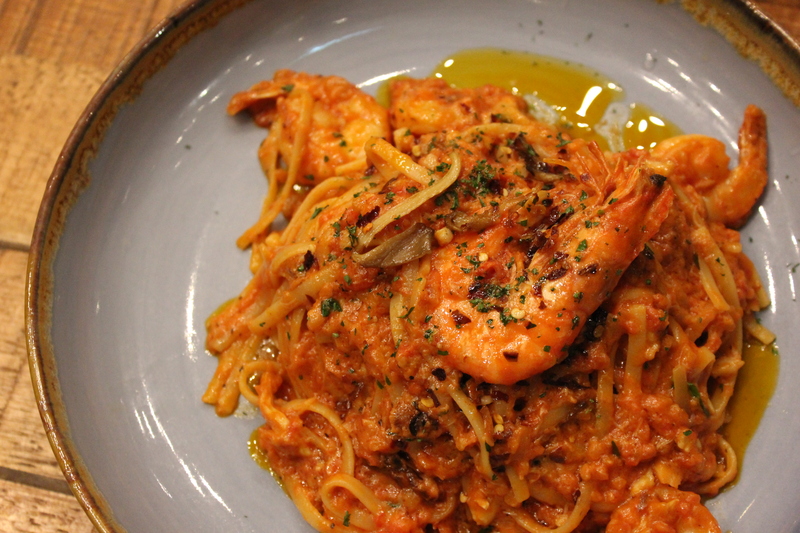 For our food, we shared the Tiger Prawn and Blue Swimmer Crab Linguini (RM35) and the Seafood Hotpot (RM38). The linguini was cooked perfectly to al dente and there was a generous amount of crab pieces along with some decent sized tiger prawns. Overall, the dish was bursting with flavours. I had a taste test of the Seafood Hotpot. 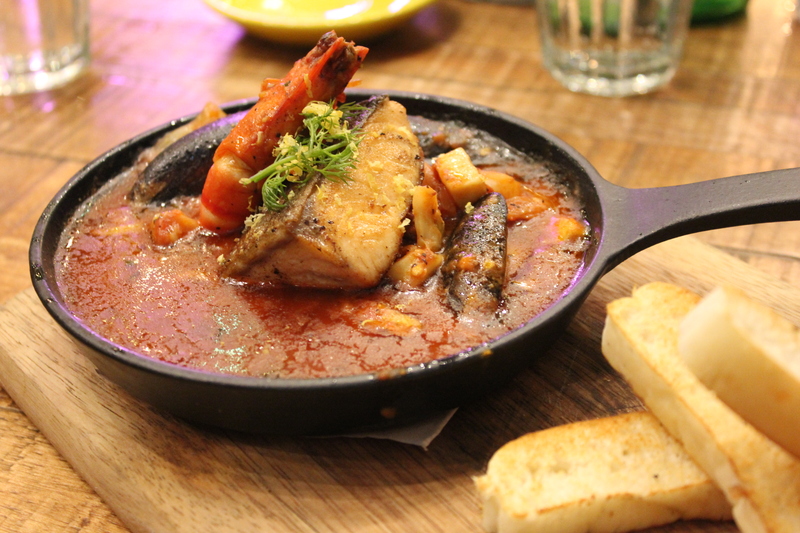 The Seafood Hotpot apparently, is one of the most popular dishes here at Jibby’s. The seafood was fresh in flavour and the tomato based sauce, together with its punchy flavours complemented the seafood well too. It was a heartwarming and hearty dish. Not long after, our Big Daddy Pizza (RM32) arrived. 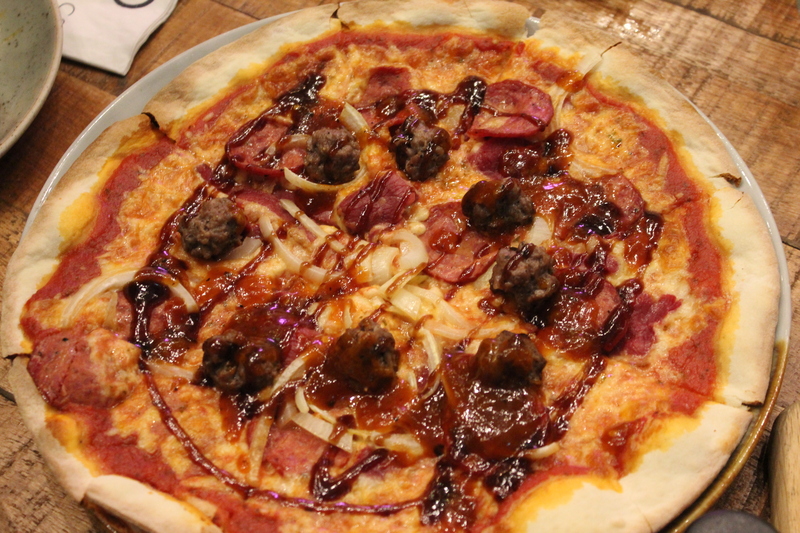 The Big Daddy pizza consists of minced beef, pepperoni, beef bacon with mozarella and onion jam. if you haven’t noticed, the food at Jibby and Co is halal, so there is no pork on the menu. If you love meat, the Big Daddy pizza is your soulmate. I must admit that when I had a look at the desserts on the menu. I was very keen to try them but unfortunately when I was there, they ran out of desserts. Oh well, there will always be a next time! 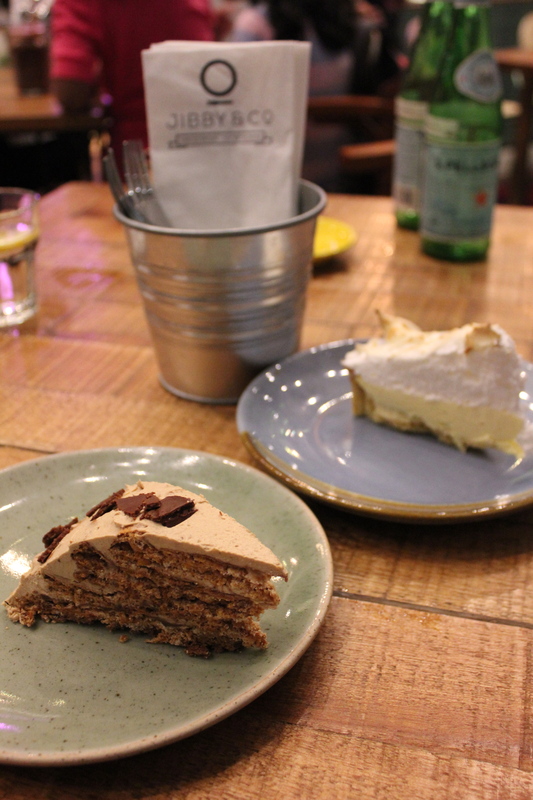 Again, I could not decide which cake to order but with the help of one of the staff, I managed to make my decision. Instead, we had the Meteor (RM16.50) and Tarty Party (RM15.80) cake. Think Ferrero Rocher. Think Meteor cake. The meteor cake consists of 5 layers of hazelnut and praline. It was heavenly. The Tarty Party is a passionfruit meringue tart with fresh flavours of passionfruit together with soft and fluffy meringue. Yes, the Tarty Party is to die for if you love passionfruit and meringue. 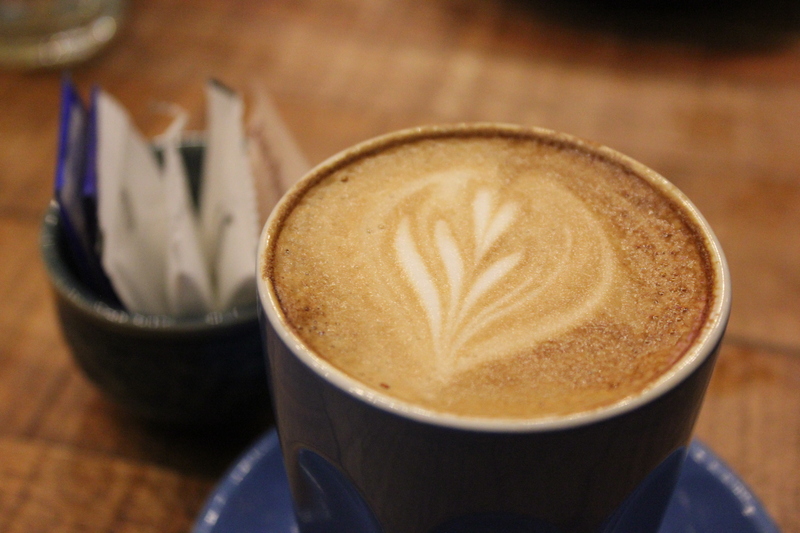 As the tagline at Jibby and Co is “Come for the food, stay for the coffee”, this suggests that their coffee must be good and worth staying for after a meal! Dad ordered a Latte (RM11) and he was impressed. I had a sip of the Latte and I must say that yes, the coffee at Jibby and Co speaks for itself. 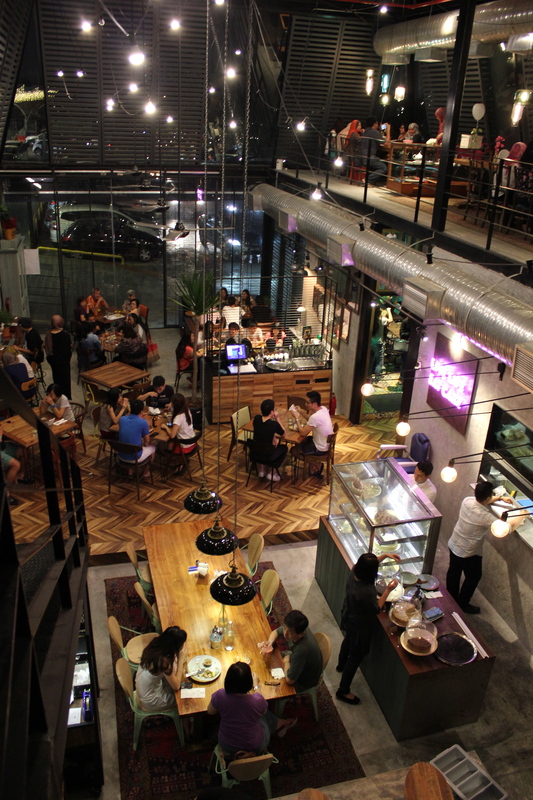 Take a look around and you will see families, couples and friends at Jibby and Co. Whether you are celebrating a special occasion, going out for a casual dinner or just catching up with friends, Jibby and Co is the place to be in Subang Jaya for good food with a nice atmosphere. Will I be back to Jibby and Co? Definitely! Oh, and Jibby and Co is also open for breakfast and lunch too!